In simple terms, financial planning is the integrated, coordinated ongoing management of an individual’s financial concerns. A financial plan is a roadmap that should be used as a guide throughout your life, not a binder that collects dust on your bookshelf or hidden away in some drawer. Before a financial plan can be initiated, we need to form a common ground with the financial planning clients. Together, we need to determine the work to be done and what terms, conditions, and limitations there might be. This is a mutual process. The data gathering stage is extremely important because without good data, informed and accurate decisions cannot be made. In this stage, the financial planner reviews all of the data and relevant documents. The planner uses his knowledge, experience, and the expertise of other professionals in the areas of tax, estate planning, and insurance to develop strategies, recommendations, and others to help the client meet his or her goals. We meet with clients to go over the financial plan to discuss the various recommendations, options, and alternatives before a plan is finalized. In areas where we do not have expertise, we consult with other professionals. For example, we would use a qualified attorney for estate planning or a qualified CPA for complex tax advice. 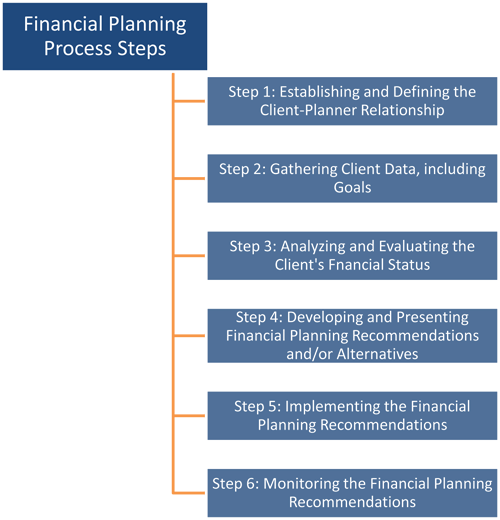 The client and the financial planner implement the plan. Without implementation, financial plans have no value. Without monitoring, it would be difficult or impossible to determine if the clients’ goals were being met or if progress toward those goals were being made. The financial plan is not meant to be looked at once and then put away; it is a guide, map, or manual to be used.